With Readly you can read All About History - Book of the Georgians and thousands of other magazines on your tablet and smartphone. Get access to all with just one subscription. New releases and back issues – all included. "When William III and Queen Anne left no heirs, and with more than 50 Catholics out of the picture due to the 1701 Act of Settlement, that meant the second in line to the throne was Sophia, Dowager Electress of Hanover. Right behind her was her son, George. Sophia and Anne died within mere weeks of one another in 1714. George I ascended the throne and in Britain, the Georgian era dawned. 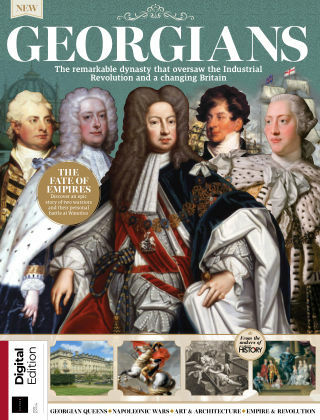 In this new edition of the Book of the Georgians, you'll discover how the dynasty cemented its place in history, from the battlefields on the European continent, the naval encounters at sea and the string of Hanoverian monarchs, to what everyday life was like for the common people of the growing cities and the well-off nobility. Meet the kings and queens who left their mark on the nation, from George III's descent into madness to the extravagance and patronage of the Prince Regent. Explore a nation in the throes of the Industrial Revolution and the people pushing the boundaries of creativity in art, literature and architecture, such as writers Mary Shelley and Jane Austen, and architects Lancelot 'Capability' Brown and the Adam Brothers. Packed with beautiful illustrations and insights into the era, this is the perfect guide for anyone who wants to learn more about this legendary period of British history."